Matthew 18:12-14“What do you think? If a man owns a hundred sheep, and one of them wanders away, will he not leave the ninety-nine on the hills and go to look for the one that wandered off? 13 And if he finds it, truly I tell you, he is happier about that one sheep than about the ninety-nine that did not wander off. 14 In the same way your Father in heaven is not willing that any of these little ones should perish. Now imagine losing your child in an amusement park. The Panic and Fear that would race through your body. The thought of something horrible happening to them is enough to make you sick. What would you do? How would you react in that situation? Your child is missing .. you go to the security office and while searching the images from the cameras, you spot your child .. He’s walking around in circles. He’s scared and crying, not sure where to turn or who to ask for help. It would probably feel like an eternity, but picture that moment when you run through the crowed and scoop your child into your arms. Imagine the tears of joy as you hold him close. In that moment everything would be complete and back to its place. The appreciation for what once was lost, now is found. I’m sure you would get on your phone and start sharing the news with the rest of your worried family.. they too would shout and rejoice like the angels in Heaven. This to me is the same image of a child of God. Walking Around lost, not sure where or who to turn to. God wants us to be as close to him as possible. There seems to always be that one kid .. he’s a little stubborn at times, maybe he’s impatient and runs up ahead. Or maybe he’s easily distracted and lags behind, before he knows it he’s lost. One way or another I’m sure we have moments where we can easily relate to this parent but even more so, to the child. I am guilty of wanting to run ahead of God’s plan and I’m most definitely guilty of lagging behind, getting caught up in the noise of life. Iv definitely listened to the voice of fear one too many times in my life. The important thing to remember is that God doesn’t panic, he doesn’t fear, He knows exactly what he’s doing. His love and patience is relentless. He’s already in the security office! He sees all and He will not give up! Scripture says he loved us before time and he will continue to love us till the end. He will however use our vulnerable moments in life to reach out! Remember the Shepard is out to save that one sheep not leave him behind. All that is needed from us is to respond. Look up and Jump into His Loving arms. 1 Peter 2:25 For “you were like sheep going astray,” but now you have returned to the Shepherd and Overseer of your souls. A Mountain In My Way! He is not going to move the mountain, if it will get in the way of something he has planned for the future. Let’s face it, we have such a hard time with patience, we try to move that mountain on our own. We push and shove and wonder why our backs hurt, we complain about the pain. ..why is this so hard? Does this sound like anything you’ve said before? Maybe you are saying it right now! Honestly, we have no idea what that mountain is keeping us from. Do we ever consider what is on the other side? What is it protecting us from? Maybe whatever is on the other side of the mountain is just not ready yet. The path is still getting cleared. We have no idea what will happen within this waiting time, my guess is with God..big things, growth, opportunity, possibly a chance for redirection??? Sometimes the only thing needed in times like this is to surrender. I know it sounds weak, it sounds like giving up, as if you are doing nothing at all. Think of it as this, it’s letting go of a tug of war that you were never meant to enter. So many of us are still trying to face our struggles on our own. When All we see is the problem that’s IN THE WAY, we are missing out on Important keys to his process…. His Way. There is still much so do within a waiting time. Quit looking at the mountain and look around. God may be using this mountain to use you, in someone else’s mountain moment. Let’s ask ourselves this, do I believe God loves me? Do I believe God can move the mountains within my life? If so, then maybe we just need to Trust that! Trust that if this mountain isn’t budging it’s for a darn good reason! Consider this, Just maybe it’s not the mountain that God is planning on moving? Maybe He’s going to do a move within you. Don’t be so quick to think God is not working fast enough. Use this time to talk with Him, to receive His peace. What happens when one side of the tug of war let’s go? The other side falls back. Think about that release, every time you are tempted to take this burden back into your own hands. My God is Capable, My God is Powerful, My God is Loving, My God is All Knowing! My God has Got This! My God has Me! I pray that today whatever the struggle is, however big or small, I pray that you let it go. Quit pushing, quit pulling. I pray that You receive God’s peace and comfort. Remember He loves you. He cares for you and your loved ones. I pray that when you lift your eyes to the mountain, you remember where your help comes from. I pray that you remember how precious His timing is and that it IS Perfect. In The Name of JESUS I Pray… Amen and Amen. The disciples were focused on the cause of this mans blindness, in other words, who’s fault was it? Jesus pointed out that this mans purpose was not to display the disability but instead, it was to show What God could do with it! “The eye is the lamp of the body; so then if your eye is clear, your whole body will be full of light. know that in all things God works for the good of those who love him, who have been called according to his purpose. HIS purpose is Perfect! His Glory will shine out of the darkness! Write this on your heart and in your mind! the next time you are faced with a difficult situation. Instead of playing the blame game or asking why, ask WHAT? What Will God Do with This! Instead of staring down the struggle, stand face to Face with our Lord, His Glory shines. Fill your eyes with Faith and let His light be on display for All to see! Where are you today? How are you holding up? I know your tired of trying. Heck, I know you’re just about done with trying. Are you having a hard time with letting resentment go, maybe it’s just gone on so long that you wouldn’t even know where to start. Maybe you’re not sure you even want it to be fixed at this point. Does it even matter anymore? You’ve been hurt and disappointed one too many times. The pain is overwhelming and too much to bear. Today I want you to Rest In The Love that God has given you. I want you to wrap yourself within His Security. You are Cherished, you are Cared For and you are Not Alone. No matter what, you have a God who is for you and believe me He knows. He knows ALL sides of the situation! Today I don’t want you to hold onto your strength. I want you to Lean on His! I don’t want you to try. I want you to surrender. You have nothing left, that’s ok! I don’t want you to give what you have , I want you to Give all that is His! He Has Plenty for the both of you!! The love of Christ is Enough for You And the person on the other side of this situation. Don’t let this struggle let you forget that! God gave You His Love When you didn’t deserve it, in this case it might be a good time to ask, am I letting this hurt withhold God’s given Love? Am I withholding love because I am hurting? Am I holding back because I feel this person is undeserving? Words were spoken and they can’t be taken back. This is true but the words that we choose from this point on can Bring Life. Please Know, That Releasing Love is exactly what Will Breath the Life back to this relationship. God’s Love IS the very thing that will Heal the hurt. But you Have to Release IT! This Love does not belong to you, It IS GOD’s LOVE! It’s meant to be consumed and absorbed but it was never meant to be withheld. give His Plan a chance to work. Let His strength steady you, let His Joy Rise within, Let His Forgiveness rein in your body. Let His Love overcome!! Let His WILL be done. Let the fight continue, but remember, let it be on HIS terms not your own. There is Power in a Forgiving Heart, There is Healing within a New Start. I know your tired, I know your limitations are being taunted with ways of escape, an easy way out! I challenge you to Ask God to stretch your Faith. I challenge you to look through God’s eyes, far beyond the boundaries, far beyond what you THINK you can handle. So you’re done trying, ok good, finally! Hang in there, this fight is not over! Take One moment at a time, but within these moments let’s choose to BUILD instead of breakdown! Let’s choose to INJECT LIFE into the situation instead of Burying it Alive! Turn to The Lord for your peace and calm, go to His word for wisdom, and take it as Truth! Believe it! It’s not always going to line up with how you’re feeling, let truth override those feelings. Apply it, Let it be His Action that takes place, not the action that your flesh desires. So Go ahead, Give Up! Give IT to God! Let it be His Holy Presence, His Mighty Power, that surrounds and takes Charge of your Life today! I am struggling today. I’m hurting and I need you. Help me to lean on you, help me to receive your peace and calm. Lord please remind me of your presence in my relationships. Help me to turn to you when I am tempted to lash out. Release your love and override my pain. Most of all Lord Help me to reflect your love even when I am hurting. Thank you for never leaving me and for always loving me. Today when we get tomatoes from the grocery store they are often hard and pale in color, the taste can be very sour. It’s because the tomatoes are rushed! They pick them before their time, just so they can withstand the travel to keep up with the Demand. It’s a quick fast world that teaches we can get what we want when we want it, just not necessarily high quality. We mass produce a bunch of undesirable junk, just so we can say it’s here for the taking. The tomatoes we get in the store will do in a pinch but they are nothing like fresh garden tomatoes, delicious red and juicy! Definitely well worth the wait! You can’t rush or force spiritual fruit either, you’ll end up with a bunch of hard hearted sour Christians that leave a bad taste in everyone’s mouth. It’s like the church saying hey we have Christians here and plenty of them! In reality if rushed or forced they don’t do any good for the Kingdom. They are not spiritually ready themselves, let alone ready to disciple those who are hungry for God. The true message and purpose gets a pass all together …nope don’t want any of that! The church is not a place of mass production. It’s a place of healing a place of development. If we would look at it as a “fruit market”, I’d say that we would want to make sure that the fruit that we send out into this world ideally, would be ripe and ready. Meaning that patience is a virtue. This fruit needs to be fertilized with Grace and Truth, with Kindness. With the Love and Compassion of Christ, Hand picked with His Gentleness and Sent out with Joy! That is what we should instill in our Brothers and Sisters, after all we need them if we want The Body to function as a unit. Don’t forget to self check! Instead of focusing on what everyone else may or may not be doing right or wrong ask, what kind of fruit am I producing? What am I feeding to my fellow brothers and sisters? Especially those who are still hard and sour. Are we giving bitterness back or are we counteracting the negative by allowing the Holy Spirit to truly guid us. We need to remember the True Gardener and follow by his example. If a tree is not producing the desirable fruit then this is the evidence that the tree needs tended to. Don’t be too quick to cut it down. Dig around it, put some work into it. Let’s not forget where good fruit comes from. It is ultimately from the workings of the Holy Spirit. It’s His stamp it’s the evidence of who we belong to. “Abide in Me, and I in you. As the branch cannot bear fruit of itself unless it abides in the vine, so neither can you unless you abide in Me. You can not force someone to have a relationship with The Lord. That’s just not how it works, it’s not how He would want it. But we can be sure to stay focused on Christ, read his word and make sure that the fruit that we are producing is of Him, so we can be better mentors. Get to know one another, reflect, encourage, and support through this walk. We can make sure that our own lives are being led by The Holy Spirit, allowing God to use us as his gardening tool. In other words, don’t be afraid to get your hands dirty and put a little work in as well. This is not to dismiss or condone a life of unfruitfulness. This is a reflection on patience, humility and forbearance when it comes to our brothers and sisters. It’s important not to forget that it took a little time for some of us to go through our process. We are all still growing and refining in our daily walk with Christ. May you hear the sound of His sweet voice. Let his love fill and overflow. Allow it to pour out onto others with no restraint. God Bless This Walk, In The Name of Jesus Christ. 51“What do you want me to do for you?” Jesus asked him. It is the same with John 5:1-9 but the message goes just a bit further. Jesus wanted to know if the men had Faith and also if they were ready for the next step. He could have just walked up and healed them easy peasy. But He made this About Faith In Action, meaning that they had a responsibility on their part. JESUS desires a two way relationship. When we call out to Him and Ask Him to change our circumstances, He’s Going To Do it, In one way or another. The question is Are We Ready, Is This What We Want? First Do We Believe He can Do it ! Second Do We Want It? Do we want Him? It’s not a one and done. He wants to continue on within our lives. He doesn’t walk away after the healing. When JESUS died for our sins he rose from the dead to LIFE! By His wounds we are healed! From transgression to transformation we rise to life! ….we walk! The blind man didn’t gain sight and go home. He certainly didn’t go back carrying on as he did when he was blind. He Followed JESUS! The Other Man got Up and Walked! He didn’t straighten out his mat and lay back down. He didn’t say thank you …I’m sure these legs will come in handy someday .. no he got up and walked! Both men were healed and they chose to do something with their new beginning. When He Works IN US He Does it BIG. What Do You Want Him To Do With You? The Answer is The Showing of Your Faith! Will it Be to See as He Sees? To Forgive as He Forgives? To Love as He Loves? To Walk as He Walks? What ever it is, just like the men, KNOW that God Can! Then understand that Christ wants you to take it on the road and use it to Follow Him! Whatever Blessing you receive, Use it to show others Who He IS. In the same way, faith by itself, if it is not accompanied by action, is dead. How long have you been in this condition? Open your eyes and receive! Thank you for All that you Are! Help me to put my trust and Faith in your abilities. I want to receive the gifts and opportunities that you have planned for my life. Remove all the fear, and negative clutter that is keeping me from getting up and taking my first step. I look forward with new eyes! Help me to remember when My foot slips or when I get knocked down you are right there to help and support as we walk together. Help me to listen to your voice telling me to Get Up! turn down the volume of the world & TURN UP THE VOICE OF GOD! The scripture says draw near to God and He will draw near to you. What happens when we forget about His Word? What happens when we neglect our relationship with God? What happens when we draw closer to The world and we set The Word aside? First off, we are not loved any less, let me just say that! But…. we are hampering ourselves. We set ourselves up to be played by the enemy and we become a disservice to God’s mission. When we keep ourselves away from that truth, we allow ourselves to conform to the things going on around us. The world rings louder and louder. We forget the part about His Way and we start looking at other ways. The world has plenty of opportunities or distractions to fill our own desires. Little by little we ignore our discernment. We begin to put false gods in our sights, working towards goals to accomplish the desires of the world. We end up falling for the patterns of deception. In turn, we are tricked into building an earthbound kingdom. Some of the materials used for a kingdom such as this are doubt, worry, fear, stress, bitterness, anger, jealousy and pride. Pretty much all the things that consume us. Not only does this keep us from receiving God’s Best, it keeps us from being productive Warriors for God. Submit therefore to God. Resist the devil and he will flee from you. Deception is not ugly, it’s pleasing, it seems right in our own sight. But we know that satan hides behind light. He prowls around looking for someone to devour and what better prey, what better target, than Someone who is left unarmed? When we are away from the truth it’s much much easier to fall for the half truth, which by the way, is a full on lie. Guys these lies are soothing, they tickle the ears in a way that justifies the half truth. If we have lost our ability to tell the difference between The Lord’s voice and the god of this worlds voice, then we might as well have never known the truth in the first place. We have A Present God, The Holy Spirit Has been Given. 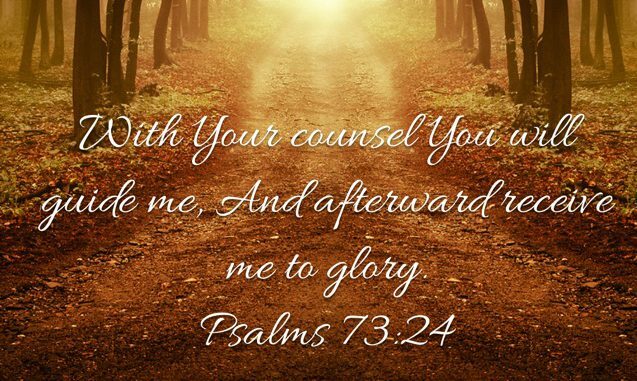 He guides and leads us along God’s path. We can be in the world, raising our families, working and living life but we must be careful not to be of the world. Don’t let it distract you from your role within the Body of Jesus Christ. Don’t forget Who you belong to, you Are a member of a UNIT and without your presence it doesn’t function to the full potential. No matter what you are involved in, no matter where you are, there is always an opportunity to reflect and project the voice of God. That means we need to turn down the volume of the world and Turn Up The Voice of God. 1 John 4:1 talks about not believing every spirit, it says test the spirits, so we know if they are from God. You see, the enemy has a voice and he also has spirits. The way we test the spirits are to measure them with The Word Of God. If it doesn’t match, then it’s a deception. We know that people make mistakes, we have a loving forgiving Father, but if we continue to cover our spiritual ears, we disregard His guidance. We are then the ones who hurt ourselves and the people who we could potentially be of service to. There is no one that can be hidden from God. Not even in the darkest of times. Still we tend to push Him away when we are in the dark, We trip over what we do not know and often end up dragging others along with us .. blind leading the blind. Get Into The Word, read what God has given. Weave it within your life. This will be what keeps you equipped to live in this world as a Follower of Christ. 1 Dear children, keep yourselves from idols. They Forsake their Own Faithfulness! It’s a choice we make and we need to take responsibility for that. Not something we want to forsake. When Faith is brought to the table Miracles happen! We need to watch out for who and what we put our faith in. Tap into that discernment, listen for the Voice of The Lord to guide. If it does not match with God’s Word then we need to adjust the volume and Seek God’s counsel.